Indian PM Narendra Modi marked the festival of Diwali with a brief visit to the Siachen glacier before inspecting flood damage caused last month in Indian-administered Kashmir. "Today India sleeps peacefully because you stay awake day and night," Mr Modi told the soldiers stationed at Siachen. Claimed by India and Pakistan, it is dubbed the world's highest battlefield. Later, Mr Modi travelled to the Kashmir valley where floods killed at least 281 people and left Srinagar under water. More than a million people were displaced. 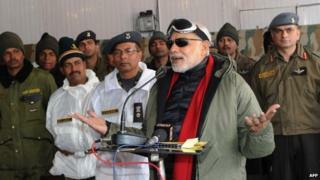 Mr Modi is the second Indian PM to visit Siachen. Manmohan Singh went there in 2005. Image caption Siachen glacier, claimed by both India and Pakistan, is known as the world's highest battlefield. More soldiers have died from harsh weather on the glacier than in combat since India seized control of it in 1984, narrowly pipping Pakistan. Soldiers have been deployed at heights of up to 22,000 ft (6,700m) above sea level. Mr Modi met senior officials and aid workers to review relief measures on the occasion of Diwali, the biggest Hindu festival. September's flooding in Indian-administered Kashmir damaged some 180,000 houses and many people are still living in relief camps. Jammu and Kashmir chief minister Omar Abdullah tweeted that people should appreciate that Mr Modi is "in Srinagar on his festival and not at home celebrating as he normally would have been doing". But people living in relief camps said Mr Modi should do more to help them. "We understand Mr Modi is sacrificing his holiday to share our grief. But this is not enough. He would be doing a great service if he would ensure the speedy rehabilitation of the homeless," Bilal Ahmad, a driver, told BBC Urdu's Riyaz Masroor in Srinagar. Kashmiri separatists called for a shutdown in protest at the visit, which follows Mr Modi's first as PM in July. Kashmir has been in the grip of an anti-India insurgency since 1989. In recent years violence has abated from its peak in the 1990s, but the causes of the insurgency are still far from resolved.